View from the press box: Are Harrogate Town becoming victims of their own success? Harrogate Advertiser Series sports editor Rhys Howell has his say on the latest goings-on at Harrogate Town. There was certainly some frustration evident among a number of the travelling Harrogate Town fans at Solihull Moors on Tuesday evening. Supporters pay their money and are entitled to be disgruntled when they don’t like what they’ve seen out on the pitch. The disappointment at a poor performance is often exacerbated when these people have had to take days off work or leave their places of employment early to make a long journey, potentially in rush-hour traffic, all the way to a destination as far away the West Midlands. When you’re paying for the privilege of suffering all of the above, what you really want when you’re stood shivering in the freezing cold on a December night is a footballing spectacle to warm you up. The least fans expect is a couple of moments to get excited about, yet aside from Kelvin Langmead’s first-half header that was brilliantly kept out by Moors goalkeeper Ryan Boot, there wasn’t too much to get the Harrogate faithful off their seats. 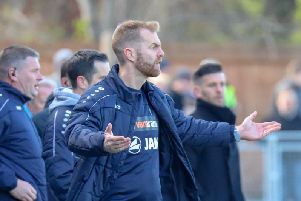 Simon Weaver’s players served up what was probably their most lacklustre performance of 2018/19 to date. Weaver himself has admitted as much, and so has captain Josh Falkingham. There’s no getting away from the fact, but, it happens. Every team has their off days, and let us not forget that Town are new to the National League. Not only that, but Solihull are a good side on an excellent run of form. Town couldn’t find a way to break down their hosts’ miserly defence, but then neither could League One Blackpool in Friday night’s televised FA Cup clash. Nor could free-scoring Salford City. In fact, none of the last six teams that faced Solihull prior to Town were able to breach their mean rear-guard. Tim Flowers’ troops have gone more than 700 minutes of football without conceding and I feel that all of the aforementioned facts and figures help put things into perspective. Weaver and his men may have lost in midweek, but they’re still third in English football’s third tier. In December. Not a bad effort for their first ever season playing at this level, and who wouldn’t have taken that before a ball was kicked this summer? The trouble is, we’ve become so used to seeing Town winning games and playing good football, that when they don’t hit those levels, the result is disappointment. Their impressive start to life in this new division has undoubtedly raised levels of expectation, and my hope is that the club don’t end up becoming the victims of their own early-season success.